ThreeSeven is a public art and placemaking design build firm creating works that activate spaces and enliven communities. Formed by Troy Gallas and Patrick McKennan in 2013, ThreeSeven has created public art and placemaking interventions throughout the Twin Cities. Troy Gallas was raised in Minneapolis, MN among a family of artists and performers and has always valued being part of a creative community. 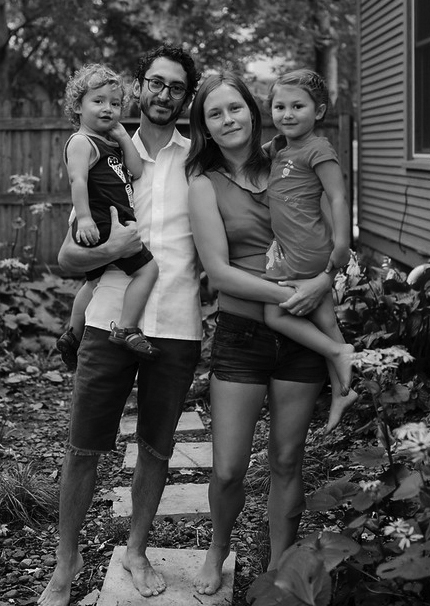 He currently lives in South Minneapolis with his wife, Erin, daughter Marion, and son Alwyn. He received a degree in Architecture from the College of Design at the University of Minnesota in 2005 and has since evolved his practice to include community and international humanitarian design, placemaking, public art, exhibit curation, and event coordination. He was co-founder of West Bank Social Center, an alternative art, community, and event space, and Works Progress, an artist-led public design studio creating event platforms, exhibitions, and installations focused on community development and public engagement. He is also founding partner in Public Design Exchange a community design organization. He possesses expertise in meaningful design, artful placemaking interventions, successful community event creation and coordination, and quality fabrication. Patrick McKennan was born and raised among a family of woodworkers and makers in Boston, MA. He is currently employed as Outreach and Research Coordinator for the University of Minnesota’s College of Design, where he collaboratively works with university partners on design and fabrication projects. He is also a founding partner of ThreeSeven, a public art and placemaking studio that aims to create opportunities, ideas, and spaces for people to rediscover and reimagine their communities. In this role, he has worked with commercial property owners, neighborhoods, commercial districts, non-profit organizations, and governmental agencies. With an education in social sciences, design, and public affairs, he possesses expertise in cultural competencies, meticulous craft, and design thinking that allows him to work with diverse communities to creatively and playfully solve problems.